Vladimir Mikhailovich was born in 1933 in Leningrad. In 1957 he graduated from Moscow Institute of Physics and Technology (MIPT). Later on he spent three years as a post-graduate student under the supervision of academician M.A.Lavryentyev. Then there come the years of organization of the Siberian Branch AS USSR, and Vladimir Mikhailovich among the nearest disciples and M.L.Lavrentev's associates took part in this nation-wide business, being in the group that prepared the experimental complex of explosion researches for the Institute of hydrodynamics, the first-born in the Branch. In this institute, V.M.Titov has passed the way from the younger scientific associate (1958) to the deputy scientific director (since 1974), and then the director of the Institute (since 1986). In 1961, he protects the Candidate's thesis, then in 1968, the Doctor's degree. 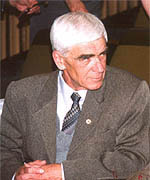 In 1979, he is elected the corresponding member of the Academy of sciences of the USSR in the Branch of mechanics and managerial processes, in 1990, he becomes the full member of AS USSR. Vladimir Mikhailovich Titov is a physicist-experimenter. Scope of his scientific activity is in several fields of knowledge, specifically, physics and mechanics of explosive processes. Vladimir Mikhailovich Titov has undoubtedly the outstanding merits in science and technology for developing the methods to accelerate solid bodies up to high speeds. The results he got in the middle 60s, remain record in many respects also nowadays. 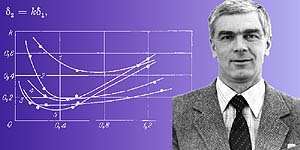 Vladimir Mikhailovich made a substantial contribution to the research of problems of high-speed (meteoric) impact and to the research of cumulation problems. Vladimir Mikhailovich is one of the supervisers and direct participants of the work on creating a method of synthesis of ultradisperse diamond (UDD) from carbon. This work is executed in cooperation with "Altai" company (Biisk), where UDD production has already become as great as several tons a year. UDD everyone are more widely used in mechanical engineering (coatings, additives, filling materials), the product became an item of export to foreign countries. For this cycle of works V.M.Titov with the co-authors was awarded with the State premium of Russia (1995). During the last several years, the pioneer works on employment the synchroton radiation for a diagnostics of physical processes behind the front of shock and detonation waves are conducted within the limits of the interdisciplinary integration project, and Vladimir Mikhailovich is among the coordinators of this project. Research of Vladimir Mikhailovich has been recognized throughout the country and abroad. Updated: Wed Feb 27 14:46:50 2019. Size: 7,977 bytes.